By buying this product you can collect up to 41 loyalty points. Your cart will total 41 loyalty points that can be converted into a voucher of $1.06. BigRamPlus is an memory extension with 256 MB of RAM for Amigas with Zorro III slots, i.e. Amiga 3000 (T), Amiga 4000 (T). Proper operation BigRamPlus extension is only assured in the original doughterboards in computers mentioned above. There is no guarantee that it will work properly in the panels of third-party extensions such as Micronik, RBM, Eagle, Elbox, DCE, etc. Compatible with kickstarts 2.0, 3.0, 3.1, 3.5 or 3.9. 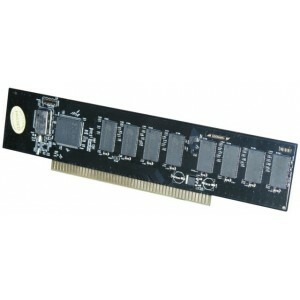 Ideal for users of AmigaOS 4.1 Amigas equipped with CSPPC cards that supports up to 128MB of RAM. If the system uses all available RAM, then starts using swap memory (hard disk). Reading from BigRamPlus is much faster than from a hard disk, which significantly increases the speed of the operating system. Requirements: Superbuster 11. Amiga 3000 (T) / 4000 (T). Note: Amiga OS4 does not allow the use of memory expansion plugged in the Zorro III slots. Moreover, the computer will not load the system. AmigaOS 4.1 can use for memory expansion plugged into Zorro III slot as swap space.